The Goat Sheds is a family ranch compound located at the base of a wooded hillside with long views down two valleys to the South and East. The house serves as a gallery to display the wife's large collection of American Indian artifacts as well as the husband's extensive collection of model trains. Each of the main functions -- living, sleeping, working, train room, garage -- are designed as individual, clerestoried sheds that are dispersed among the existing trees in such a way that no trees had to be cut down. The "sheds" are connected by low service spaces. The husband once worked on the ranch as a young adult when it was owned by his future wife's family. During that time it was being transformed from a goat ranch to a cattle ranch. His future wife's father wanted to determine if this young man was a hard worker and worthy of his daughter, so he gave the suitor the job of dismantling all the old goat sheds that were scattered over hundreds of acres. He did, the father approved, and they were married. They affectionately call the new house the Goat Sheds. New 1000sf house with very tight budget. The client wanted to "live small" and leave a small carbon footprint. She had researched prefab houses, but found they were beyond her budget. In the end we found it was less expensive to design & build a similar house on site. 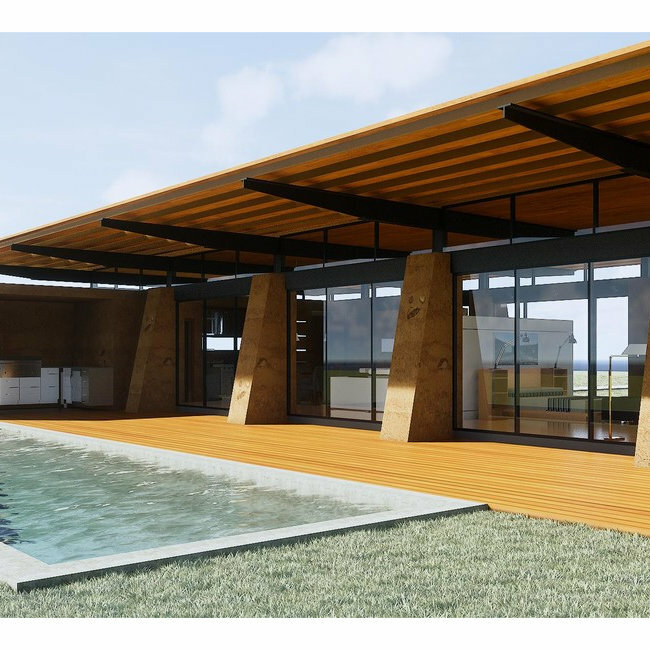 The project is a composition of elements that are tied together by a strong circulation axis--the boardwalk--that organizes guest parking at one end, takes the visitor through the carport, across a Zen courtyard and to the front door. 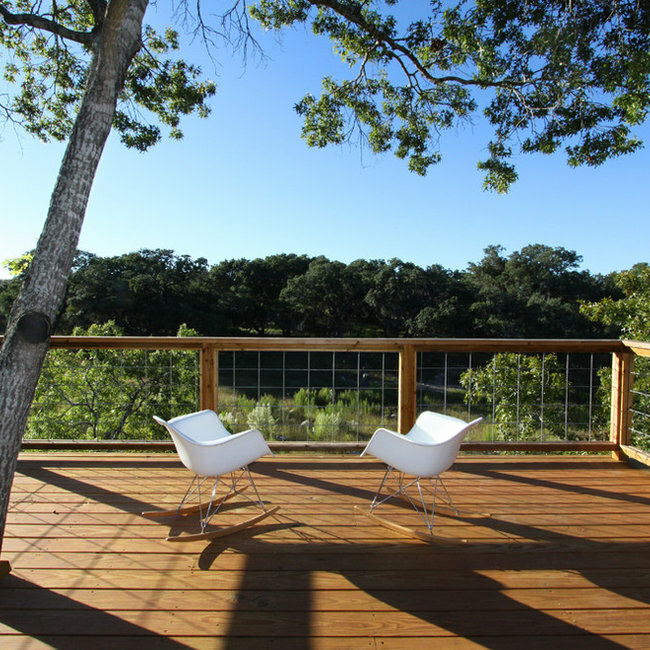 From there it proceeds through the house, across the back yard and terminates at a wood deck that cantilevers over a limestone bluff that overlooks the creek below and the nature preserve beyond. Sealed concrete floors throughout the house, IKEA kitchen, and corrugated Galvalume metal exterior siding were used to keep costs within budget. 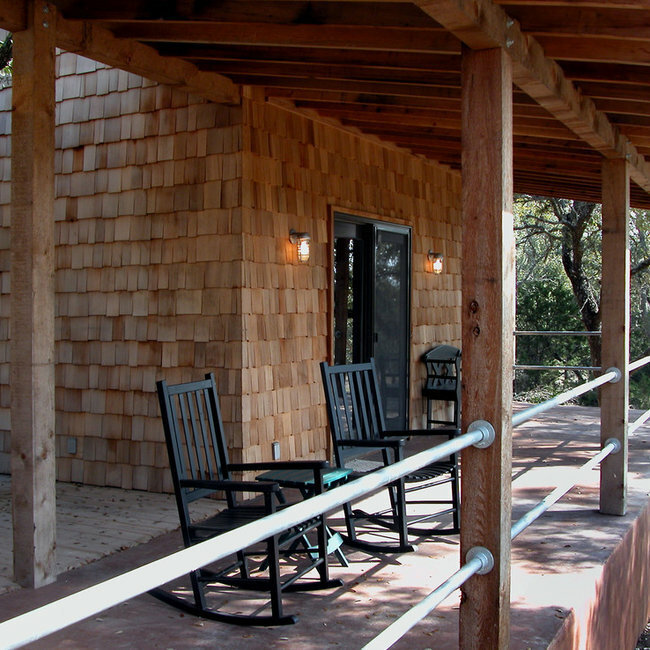 A new weekend getaway on large ranch in Brewster County, Texas. The ranch is largely flat desert terrain with the Chisos Mountains in the distance. 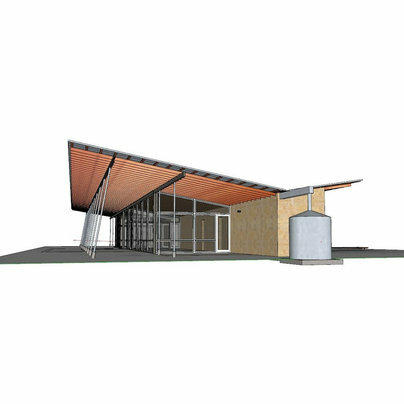 The concept has four components: a large, flat roof to provide shade; rammed earth piers to anchor the building to the desert site; glass walls to visually allow the desert floor to pass through the structure, and a solid, rammed-earth “core” that contains the service spaces and serves as a visual counterpoint to the glass box. 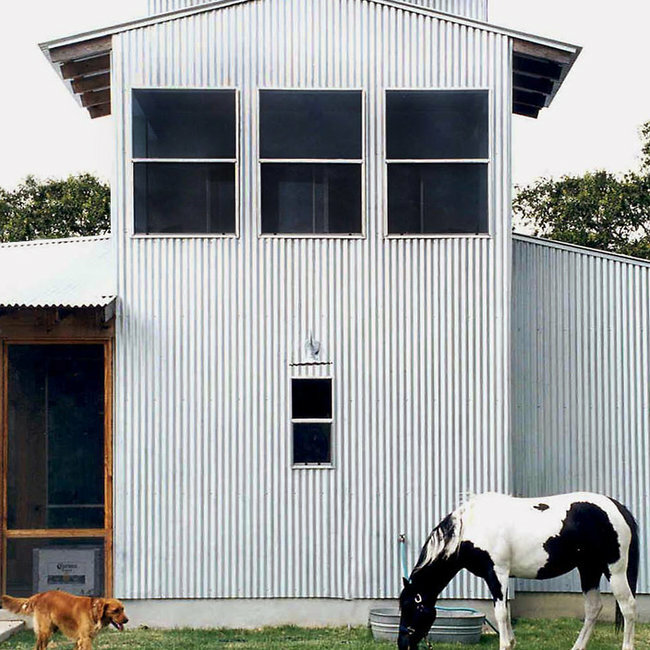 An old house trailer on a family ranch in Beeville, Texas was used for decades as an inexpensive weekend getaway. 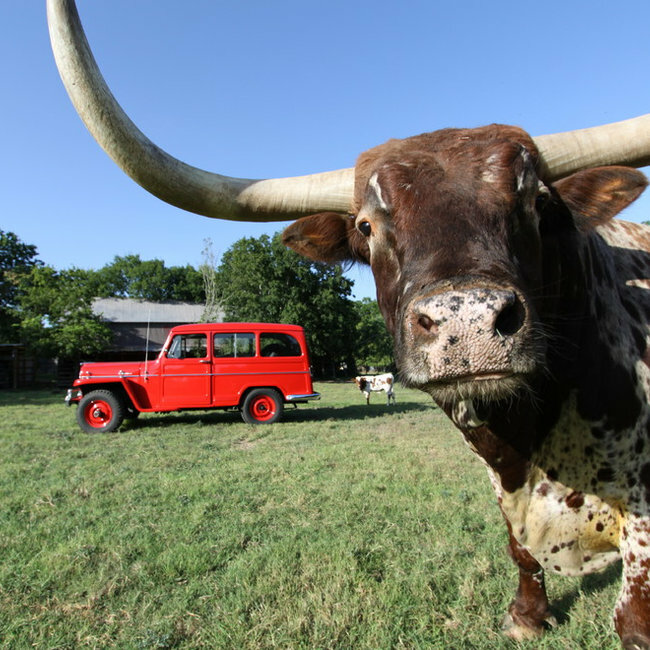 The owners recently retired, sold their house in Corpus Christi, and were moving full time to the ranch. They wanted to invest the money from the sale of the house for their retirement instead of using it to build a new house on the ranch, so they decided to live full-time in the existing trailer house. There were only two problems. The first problem was that the trailer was looking shabby on the outside. The second problem was that the trailer looked..... like a trailer. The solution was to give the trailer a "facelift" and disguise its trailer-like shape. Since the site was a heritage ranch and the surrounding area was agricultural, we went with a farm-ranch/industrial/agricultural theme reminiscent of barns, sheds, cotton gins and feed mills. We sheathed the entire structure in corrugated Galvalume metal. To break up the long trailer shape we added porches, decks, and a small additions. At the front we added a carport and entry pergola of 6x6 cedar columns and beams. The other ingredients were galvanized pipe and fittings and industrial light fixtures. "Fish Camp" is an affectionate name for a rustic, camp style family retreat where three generations come together and enjoy the outdoors and each other. 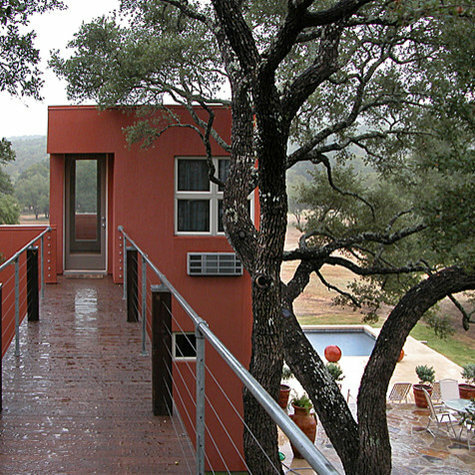 The site is 35 acres of oaks and juniper outside of Fredericksburg, Texas. The site was left completely wild, with only a gravel road disturbing the natural setting. We built the house in a small, linear clearing among some oak trees and dug a small lake nearby for swimming, fishing, and canoeing. The compound is composed of three buildings: the Gathering Room (kitchen, dining, and living), the Bunk House (sleeping for six, and the Owner's Retreat (Master Bedroom Suite for the grandparents, who live there full time). These buildings are loosely tied together with open and covered decks and screened porches. The three buildings were laid out between the existing oaks so that no trees had to be removed. We used cedar, stone, concrete, and galvanized pipe as the major materials. All interior and exterior floors are stained and sealed concrete. Exterior siding is split cedar shake and local stone. Roof is Galvalume steel standing seam. The Gathering room structure is traditional mortise and tenon timber frame. The idea for this house came to me in a dream. I live nearby, so I visited the hilly, wooded site many times at various times of the day, and walked it often before sketching anything. One night I had a dream of a castle, a ruin on a hill, where only the watch tower remained. I set that tower on our site, and I created an imaginary, romantic history for the house. I described it to my clients over dinner, and they were intrigued by the idea. The story goes like this: while they were exploring the hills, owners Pat and Jim came upon a mysterious ruin: a stone tower that was the only remaining piece of a larger structure. They bought the land, and over time they restored the stone tower and built new rooms around the tower’s base to create the house. Pat and Jim presented me with some design challenges: no 90-degree corners in the house, and no doors. They wanted the house to fit in with its natural surroundings with views from every room, lots of glass, natural ventilation, and outdoor living spaces. 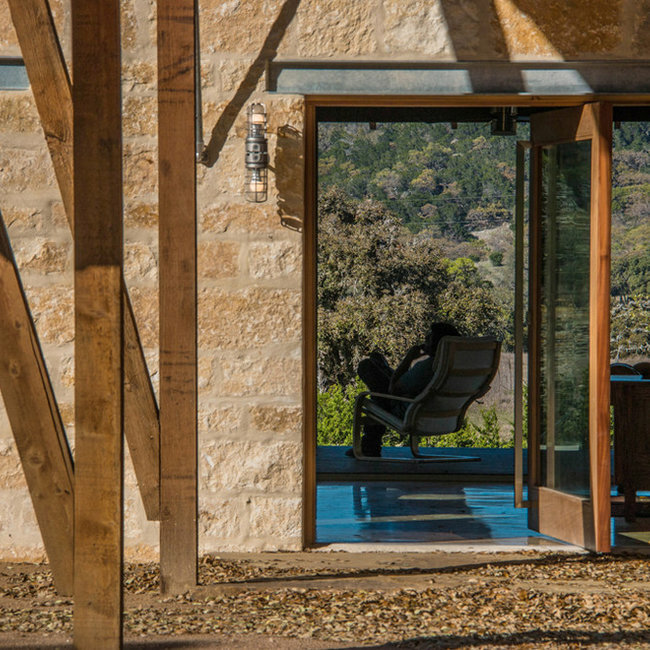 I designed the house with the stone tower as the organizing element with the rest of the house as pie-shaped "pods" strung along the curving contour of the hill. The house is like a string of pearls laid in a shallow curve, each room slightly canted from the other, and each with a different view of the surrounding hills. Each pod opens onto its own deck. Outside, the house has two faces: the front, public face is solid, closed and mysterious, with hardly any windows, although the curved "arms' on either side of the tower beckon the visitor with an open embrace. The rear of the house is all glass and open, with large overhangs for shade and wood decks for outdoor living. It embraces the outdoors. Inside, the entire ground level is floored in a wonderful flagstone, which warms the feel of the house and visually ties the rooms together, which flow into each other. The master bedroom suite is all open, with no walls between the bedroom and bath. A freestanding cylinder (the shower) and tall cabinet (the headboard) act as privacy partitions. And what about the "no doors" policy? OK, I used three doors: one for the pantry, one for the mechanical room, and one for the powder room. This house was featured on the television series Homes Across America on HGTV. I designed this weekend house for our friends in Corpus Christi. In the early seventies, Bonnie and L.J. bought 116 acres of rolling hills blanketed with live oak and juniper outside of historic Goliad, Texas. With a group of friends they constructed a quaint but rough little two room cabin to get away on weekends. We used to stay with them and their young daughter Blair, and it was fun to rough it. As the couple got older, they didn't want to rough it any more. They wanted something a little more refined. Something with plumbing, electricity. And maybe air conditioning. A flat, prow-shaped hill, the highest spot on the property, was chosen as the building site for ease of construction and because of spectacular 180-degree views of the surrounding countryside and Manahuilla Creek below. The hill is adorned with a large, heritage oak. We went back and forth on the concept for the house. What size should it be? What materials? Rustic or modern? L.J. stood at Rustic end with thoughts of using an antique timber frame barn as the basis for the new house. Bonnie stood at the Contemporary end, with all the modern comforts and conveniences and easy-maintenance materials. They eventually reached a compromise, as all good marriages do, and agreed to build something both rustic and contemporary. The finished product is a modern interpretation of local nineteenth-century farmhouses, barns, and simple cabins. The house is clothed in traditional wood lap siding and galvanized tin roof, and the size and scale is respectful of its local ancestors. The south end of the house is more solid and traditional with small, sparsely spaced windows, but as one moves to the north end of the house the exterior becomes lighter and more transparent; more modern. The two-story main living space has glass walls on three sides to take advantage of the 180-degree views. On the north end, a two-story glass wall frames the massive oak tree and bathes the interior with soft northern light. 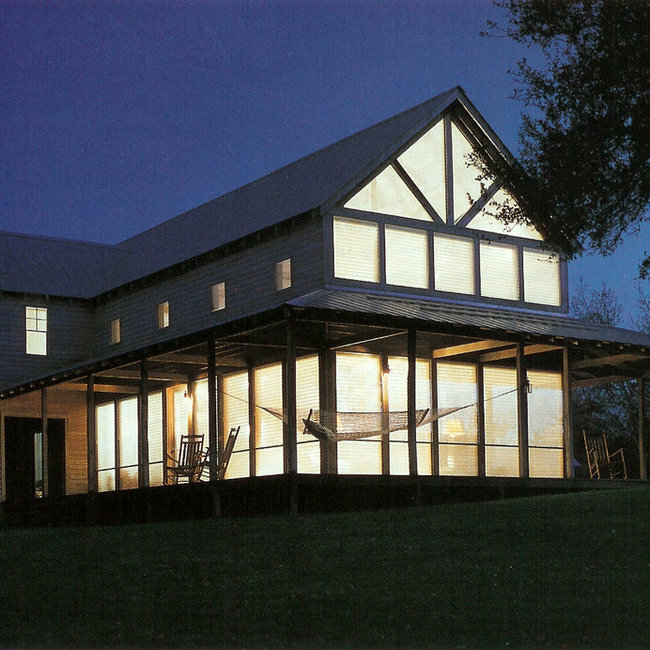 Covered porches wrap around the main room to shade the glass and provide outdoor dining, lounging, and recreation. The land is bountiful with fauna. Deer, wild hogs, armadillos, raccoons, ringtails, havelina, and wild turkeys roam the property. One of the many recreational activities at dusk centers around frozen Margaritas, rocking chairs, and binoculars to admire the wildlife. 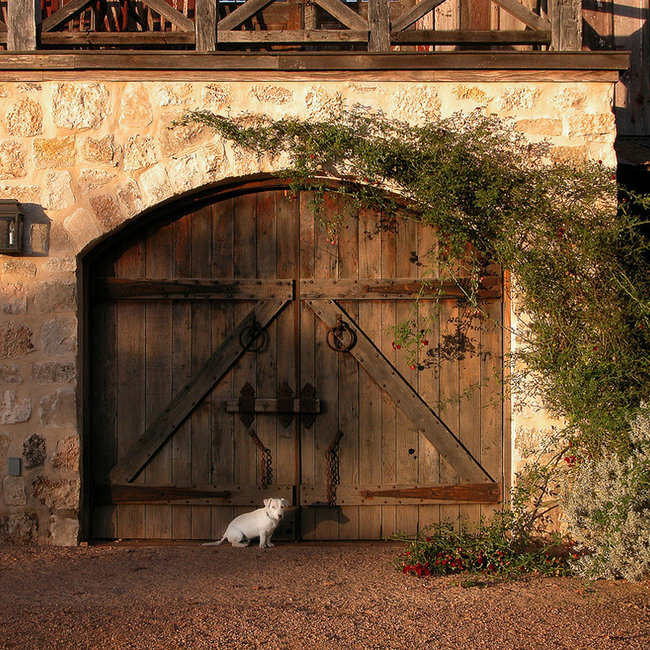 The site for the house, a 500-acre ranch, is located in the Texas Hill Country, an area settled in the mid-1800s by German immigrants, who used the local limestone and long leaf pine and cypress to build their structures. The clients asked for a new house that, when finished, would look like it had been there for 150 years. We researched historic German farms and homes in the area for authentic house and farm types, materials, and details. The program for the house was large and complex, so we decided to emulate a generational farmstead, where each generation of the family adds onto the original buildings and build new structures or tie together old ones, creating a complex of buildings over time. We fabricated a "history" for this farmstead---the log cabin was built by the great grandparents who settled here, then as the family grew, they added a water tower and a barn. When their children took over, they built the big stone house. Their children connected the barn to the log cabin and added a smaller house next to the big house for their children. The result is the compound you see today. 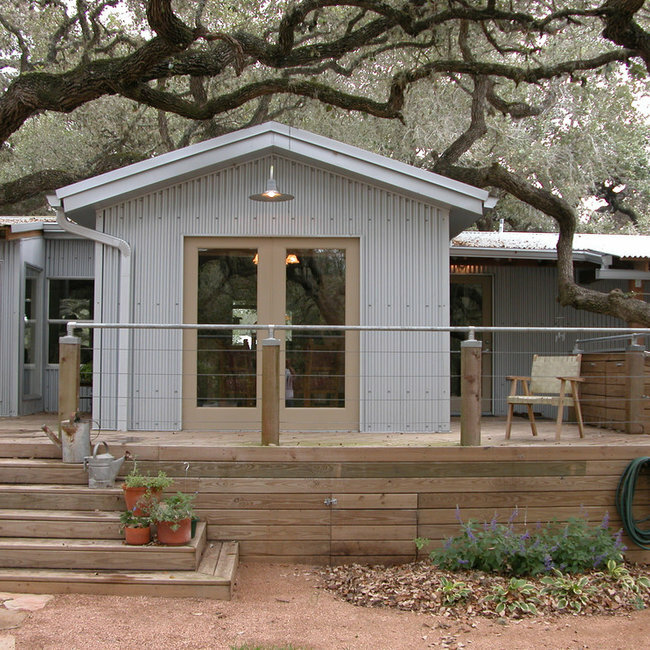 We used recycled timber, beams, flooring, wood siding, rusted tin, and rock to build the house. All the conveniences found in a modern home were hidden or disguised. A local blacksmith produced door and window hardware as well as fireplace hardware. Windows and doors were milled from old growth pine. Even the glass was reproduction "wavy" glass to emulate vintage glass. The owners went to great lengths to fill the house with correct antique furniture and furnishings. Near the end of construction, a visitor to the site told me, "They are doing a great job of restoring these old buildings!" They couldn't have given me a better compliment. Clients wanted a simple, compact house with big views. 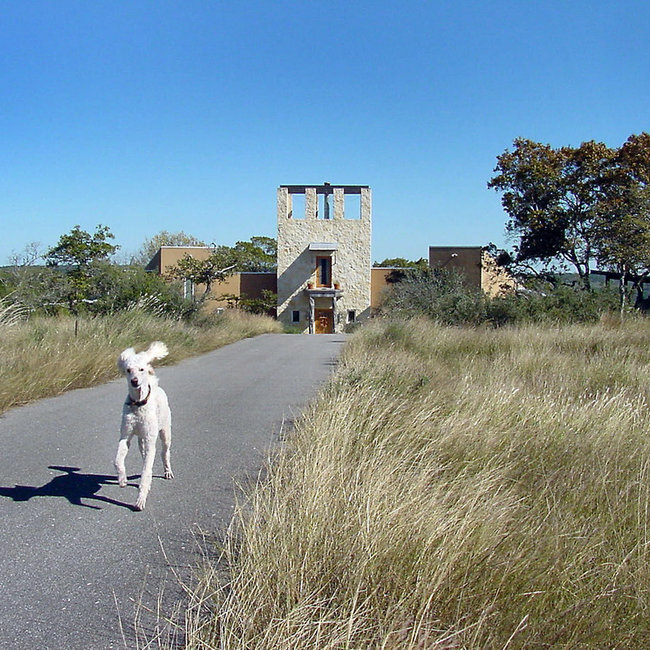 The site is a 20-acre parcel of rural land outside Bandera, Texas, with long views to the southeast.